******* NASCAR Race Mom will also be tweeting Moses’ Race, green flag to checkered! You can also read the updates on the live blog above. Leave a tweet using the #MosesRace hashtag. Your tweet will automatically be posted to the live blog also. Tweets will appear in the live blog almost immediately. ANTELOPE, California — Moses Smith, pilot of the No. 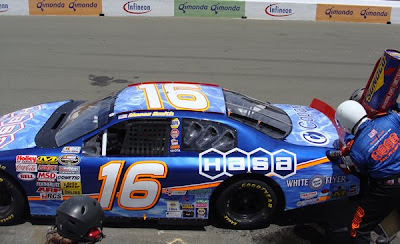 16 HASA Pool Products/White Flyer Toyota Camry for Bill McAnally Racing finished 14th after the No. 16 Hasa Pool Products suffered two flat tires and missed a practice because of a mechanical problem at Portland International Raceway. The No. 16 Hasa Pool Products Toyota had a clutch problem during the first lap of the first practice. Crew chief Mario Isola and the team from BMR made a quick repair and Smith was able to put the car in 13th of 26 cars during the second practice session. He took one lap during the qualifying session to put the Hasa Toyota eighth on the grid to start the race. Smith gained two positions before completing the first lap of the 66-lap race. At lap 18 while under caution, Isola called Smith to pit road and packed the No. 16 Hasa Toyota with Sunoco fuel. Smith reentered the race in 12th and five laps later, was on the board in fifth. At lap 31, Smith suffered a right front flat tire and had to pit under green. He went a lap down and was in 20th as he reentered the race. He would have a second flat at lap 40 this time with a right rear tire going down. Miller has been a track where Smith has done well. Last year, Smith’s qualifying time was faster than the previous year’s record time. He charged towards the front under a green-white-checked scenario and finished in fourth. "I was excited over my 4th place finish," continued Smith, "We had a good strategy for the race, great pit stops, overall just a good time. Miller Motorsports Park is an awesome facility, easily becoming one of my favorite tracks to race at." Smith is eighth in the chase for the NASCAR Camping World Series West championship and only 71 points out of the top-five. Smith and the No. 16 Hasa team would like to thank their race partners and their fans for all their support. There were over 1100 Hasa customers in the Hasa Hospitality tent at PIR. Smith really enjoyed visiting with them and signing autographs before the race. For more information of the race at Miller Motorsports Park, please visit www.millermotorsportspark.com. The track is located just 35 minutes outside Salt Lake City. The green flag for the NCWS West race will drop at 1:45 pm with qualifying for the race slated for 10:00 am. For more information on Bill McAnally Racing and our race partners, please visit our website at www.billmcanallyracing.com. For more information on Moses Smith, please visit www.mosessmith.com. You can visit our sponsors’ websites at www.hasapool.com, www.whiteflyer.com, and www.tcitransportation.com . Please visit the NASCAR Home Track page (http://localracing.nascar.com/) to vote for the Most Popular Driver. Smith was the recipient of the 2008 MPD Award for the NASCAR CWS West. The race … This event is the 10th race for the NASCAR Camping World Series West in 2009. It is the third of three road-course events this season and marks the only visit to the state of Utah this year. The track … Miller Motorsports Park is a multi-purpose road course with four possible configurations. The track is located adjacent to Tooele County’s Deseret Peak Recreation Complex, approximately 35 minutes from downtown Salt Lake City. The procedure … The starting field is 30 cars, including provisionals. The first 26 cars will qualify through two-lap time trials. The remaining four spots will be awarded through the provisional process. The race will be 41 laps (125.46 miles). The records … Qualifying: Jason Bowles, Aug. 2, 2008, 94.888 mph, 116.095 seconds; Race: Jason Bowles, July 14, 2007, 70.384 mph, 1 hour 46 minutes 57 seconds. Championship battle … Jason Bowles has increased his lead in the championship standings to 33 points over defending series champion Eric Holmes (No. 20 NAPA Auto Parts Toyota). See-saw rookie chase … The tight battle for this year’s Sunoco Rookie Award continues between Blake Koch (No. 21 GodSpeaks.com Chevrolet) and Paulie Harraka (No. 12 NAPA AutoCare/Adaptive One Brakes Toyota). McGriff rolls on … After finishing 13th at Portland (Ore.) International Raceway, 81-year-old Hershel McGriff (No. 04 Park Corp. Chevrolet) heads to Utah – where he will get his first look at MMP. Experience at MMP … Only eight drivers competed in both NASCAR Camping World Series West races held at MMP – in 2007 and 2008. Top finishes … Mike David (No. 2 Bennett Lane Winery Ford) is the only series driver with two top-five finishes at the Utah track. He finished third in 2007 and second in 2008. Top 10s … Mike David and Jason Bowles are the only drivers to finish in the top 10 in both series events at MMP. Bowles won in 2008. Practice>>11 a.m.-12 p.m., 1:45-2:45 p.m. The long-awaited day had finally arrived. We were on our way to the Auto Club Speedway in Fontana, California for my husband’s day at the Richard Petty Rookie Experience. We had won the class from the Save Mart “Start Your Engines” contest. We arrived about a half an hour early, and the nice people who collected the compulsory Liability Waiver and Participant Information Medical Form, signed Paul up for the Ride-Along Experience. “It will help you get a feel for the track,” they stressed. 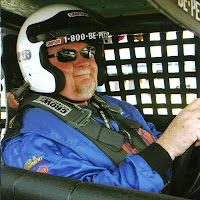 The Ride-Along placed Paul on the passenger side of a two-seater, NASCAR-style stock car driven Andrew Lewis. Lewis, a local racer, captured the Grand National West Sunoco Rookie of the Year title in 2005 while driving for Bill McAnally Racing. (Moses races for BMR this year). Paul really enjoyed the three-lap qualifying style run at speeds that reached upward to 165 miles per hour. The “classroom” portion of the rookie experience was well organized. Chris, the instructor kept the material interesting with stories and humor. 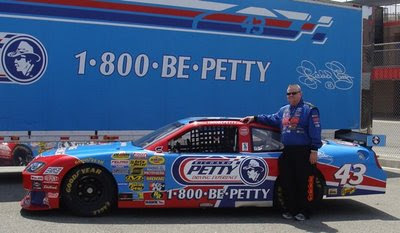 “You’re Part of the Petty Family now,” he announced and the RPE staff made us feel right at home. After the Orientation and Video; twenty minute On-Track Instruction; Mechanical and Safety Instruction; and a ten-minute Mandatory Driver’s Meeting, Paul was suited up and waiting for his turn behind the wheel. The rookie experience consists of the rookie (Paul) following the instructor around the track for eight laps. The instructor’s car is equipped with a yellow light and a green light. If the rookie sees the yellow light, he/she is following too closely, and needs to get off the gas. If the green light is displayed, the rookie is lagging too far behind. While Paul had the time of his life, he was disappointed because the yellow light was on a lot, and he was not able to go as fast as he desired. Paul’s top speed was one hundred and thirty-eight (138) miles per hour. He believed that he was capable of going much faster than that had he not had to remain behind the instructor’s vehicle. Before I watched my husband participate in the Rookie Experience, I has planning on saving up the four hundred dollars ($400.00) necessary so that I could participate in it myself. However, now I realize that the Richard Petty Experience is not a Disneyland ride. I do not possess the minimum driving skills necessary. First off, I have not driven a stick shift in over ten years. As Chris informed us at the beginning of the class instruction, the Rookie Experience is not a driving class. So for now, I am planning of saving the one hundred and ten dollars ($110.00) it costs for the Ride-Along. On a scale from one to ten, where ten is the best, Paul rated his experience as a nine. “The guy would not go fast enough for me,” Paul grumbled. However, I know that Paul is looking forward to doing it again. On a scale from one to ten, where ten is the best, I would also have to rate my experience as the guest of a participant as a nine. The staff was awesome; very friendly and helpful. The on-track action was thrilling. However, I had to deduct a point due to the cost of the RPE souvenirs. We spent an additional hundred and sixty dollars ($160.00) for a nice plaque and video. The Richard Petty Experience is a one of a kind NASCAR adventure. If you are a NASCAR fan (or not) it will give you a greater appreciation about the sport. If you get the opportunity to participate in the Ride-Along or Rookie Experience, I recommend that you do it. It is a place where memories are made. I cannot wait until it is my turn! The nice people at the Richard Petty Experience supplied me with a 1:64 Die Cast Car - Richard Petty Driving Experience #43 - Dodge Charger to give to one of my readers. If you would like to win it, just leave a topic related comment below. Be sure that you leave me a way to contact you; contest will end 8/3/2009. Oh yeah, please remember to vote daily for Moses Smith for Most Popular Driver - Click here for the easy no registration vote. PORTLAND, Oregon. 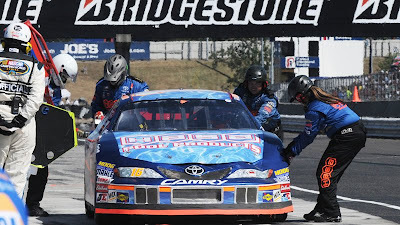 (July 19, 2009) – The return of the NASCAR Camping World Series West to Portland International Raceway featured a thrilling dash to the finish on the final lap, with Jim Inglebright taking the victory over Greg Pursley and Brian Wong in the BI-MART Salute to the Troops 125. The Hasa team suffered from clutch issues which cut their practice short. However, with only a few practice laps completed, Moses managed to qualify the #16 Hasa Pool Products / White Flyer Toyota Camry in eighth position. On race day, Moses’ car proved to be fast and he raced the first twenty-two laps within the top six. 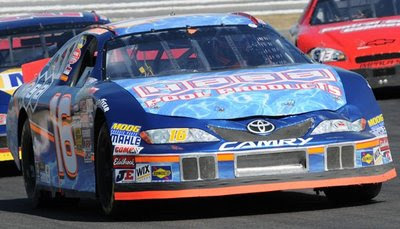 However, two flat tires forced the #16 Hasa Pool Products / White Flyer Toyota Camry down a lap. Later in the race, Moses became the victim of some contact among the leaders, which caused more damage to his car. The Hasa Team had to settle for a disappointing fourteenth place finish. The Hasa Hospitality tent held over eight-hundred Moses Smith race fans. The weather was warm and the food was delicious. The Hasa guests had an excellent view of the last corner of the course. Their cheers could be heard each time their Hasa driver maneuvered into their vision. This event marked the return of the series to the 1.98-mile road course, which it last visited in 1986. Hershel McGriff, who won that race 23 years ago, was back at the age of 81 to defend his race title and finished 13th, just ahead of Moses. The next event on the schedule for the NASCAR Camping World Series West will be at Miller Motorsports Park in Tooele, Utah on August. 1, 2009. UPDATE: The interview went well - you can listen to the rebroadcast by clicking here! 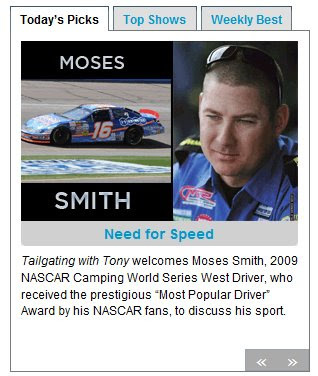 This Thursday (07/16), NASCAR Camping World Series West Driver, Moses Smith will be a guest on Tailgating Internet Talk Show by Tailgate Trackside. The show offers everything from your Grill to your Tailgate plus Racing news from your favorite series. The thirty minute show will feature NASCAR Driver Moses Smith. Moses, who is currently eighth in the 2009 NASCAR Camping World Series West, is entering his third full season. He recently received the prestigious “2008 Most Popular Driver” Award by his NASCAR fans. For the first time, balloting was conducted online resulting in an overwhelming global response to Moses. ‘Tailgating With Tony’ and Moses will talk about Tailgating, Racing, and how to have a good time doing it. Join them live this Thursday Night at 10:00 p.m. CST. You can also join them live in their chat room and/or call into the show. The call in number is (347) 843-4942. The last time the NASCAR Camping World Series West raced in Portland was 1986 when Hershel McGriff, then fifty-nine years of age, took the championship and Chad Little was named rookie of the year. Portland International Raceway is a 1.967 mile road course that features twelve turns on an asphalt/concrete surface. There is only a five foot elevation change throughout the track. Portland International Raceway is one of three road course races this season. The other two are Infineon Raceway in Sonoma, CA and Miller Motorsports Park in Tooele, UT. McGriff, retired twice from NASCAR racing. He retired once in 1954; then came back in the mid-1960s. In 2002, Mr. McGriff retired again. The eighty-one-year-old racer planned on racing at all three road courses. The only problem was that one of NASCAR's 50 Greatest Drivers and multiple halls of fame — including the Oregon Sports Hall of Fame — was unable to qualify for the Sonoma race and did not get a provisional into the race. Hershel McGriff is the PIR Defending Champion. For the record, McGriff won the series' only other stop at P.I.R. ; that race coming in 1986. Like my son, Moses Smith, McGriff lives in Arizona. McGriff was voted Most Popular Driver twelve times over his long NASCAR career. This honor has been awarded in the west series since 1965. Hershel McGriff receive the MPD Award in 1981, 1982, 1983, 1984, 1985, 1986, 1987, 1988, 1989, 1990, 1991, and 1992. Moses was the recipient of the prestigious award last year. 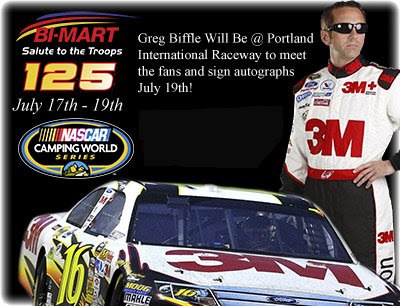 Greg Biffle will be at Portland International Raceway to meet the fans and sign autographs on July 19th from 10:00 a.m. until noon! Greg is off to a great start this year, spending most of the season in the top 10 in Sprint Cup points. Greg's appearance will coincide with an action packed weekend at PIR, including the NASCAR Camping World cars racing on Sunday as well as the historic Cup cars of the Stock Car Race Series and the locally based Great American Stockcar Series. Moses and I will be there participating in the Camping World Series West race. I hope that I get the opportunity to meet Mr. Biffle. I find it cool that Moses and Mr. Biffle both race the same number. Advanced weekend packages are only $25, available at Portland area Bi-Mart stores or on the Portland Nascar Website tickets page. Weekend ticket packages bought at Bi-Mart include a free pit pass, available while supplies last. If you would like a complete breakdown of the weekend please CLICK HERE to download the pdf. Moses Smith, pilot of the No. 16 HASA Pool Products/White Flyer Toyota Camry for Bill McAnally Racing is looking forward to returning to Portland International Raceway. He’s raced at the nearly perfectly flat twelve-turn road course which sits a short distance to the famous Columbia River. The last time Smith raced at PIR was in an open-wheeled car. 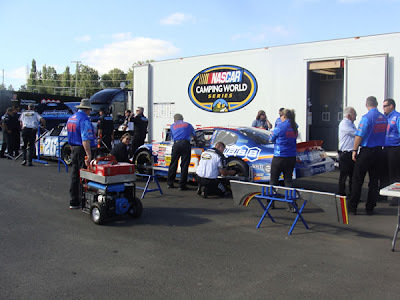 This is the first time since 1986 that the NASCAR Camping World Series West has come to PIR. It was previously on the schedule hosting the NASCAR Camping World Truck Series from 1996 thru 2000. The track has changed at bit since Smith last raced there. In 2008, track renovations were complete as two turns were widened and the track repaved with new asphalt. Smith is now eighth in the chase for the NASCAR Camping World Series West championship and only 79 points out of the top-five. He received the Featherlite Most Improved Driver Award with his ninth place finish at the Toyota Speedway. The NASCAR Camping World Series West Bi-Mart Salute to the Troops “125” will be televised July 30th on SPEED Channel’s Racing Across America noon pacific time. Please check your local listings. Advanced ticket purchase offer of a combined Saturday/Sunday ticket of $25 is available online at www.portlandnascar.com or at participating Portland metro area Bi-Mart locations. US Military personnel will be admitted free with military I.D. The clear choice for pool professionals! HASA is the purest, strongest fastest working liquid chlorine available to the water treatment and swimming pool industries. HASA has been keeping your water safe and clean for over 45 years. Fans can once again cast their votes for the Most Popular Driver of the Year Award for the NASCAR Camping World Series West. 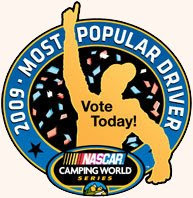 Last year was the first season NASCAR fans were given the opportunity to vote for the most popular driver in this series. Over 7500 people took advantage of the opportunity and voted via the NASCAR.com website. The 2008 recipient of the special award was Bill McAnally Racing's Moses Smith, driver of the #16 Hasa Pool Products/White Flyer Toyota Camry. "I was absolutely surprised when NASCAR announced that I was voted as the Most Popular Driver," said Smith. "I was excited that I could deliver what the fans want. For me, racing has always been about friends, family, and fans. I would really love to win this special award two years in a row!" Smith has been a NASCAR fan favorite since he made the switch from driving open-wheeled cars in 2007. Whatever tracks the series visited, hundreds of Moses Smith fans could be seen and heard in the grandstands cheering for the Hasa Toyota team. Moses would like to thank the thousands of Hasa customers who have continued to support him throughout the season. Fans may vote once per day at (click here to vote) and are encouraged to vote throughout the season. 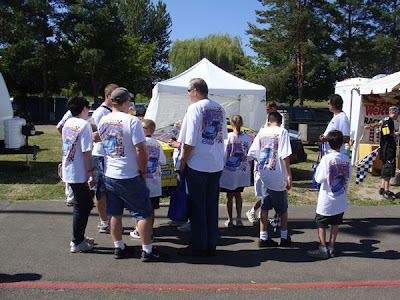 Balloting for the Camping World Series West ends on September 26, 2009. The results of the voting will once again be announced season-end banquet. Last year, every fan vote was crucial. The closest battle was in the NASCAR Camping World Series West where Moses Smith won the award by percentage points over teammate Austin Cameron. Of the 7,612 votes tallied, Smith earned 15.409% while Cameron totaled 15.151%. If you would like a daily reminder to vote, please send your email address to vote@mosessmith.com. A Toyota Camry Hybrid make its debut as the pace car at TOYOTA Speedway in Irwindale, California on July 4th when it led the starting field of twenty-one drivers in the King Taco “200” NASCAR Camping World West Series race. The 200 laps around the half mile oval was completed in one hour and nineteen minutes. Hasa driver, Moses Smith qualified his Toyota Camry for this race in twelfth place. Although he struggled with an ill handling car which dropped him back in the field early in the race, Moses managed to thrill his fans with a ninth place finish. “We tried to improve the car’s handling during the break at lap 100, but missed the set-up just a bit.” Moses reported. The 2009 season of the Camping World Series has added Portland International Raceway to the venue list. The next Camping World Series West race with be held at the Portland International Raceway on July 19th. The last time NASCAR Camping World Series raced in Portland was 1986 when Hershel McGriff took the championship and Chad Little was named rookie of the year. The Portland International Raceway is a 1.967 mile road course that features 12 turns on an asphalt/concrete surface. There is only a five foot elevation change throughout the track. Portland International Raceway is 1 of 3 road course races this season, the other two are Infineon Raceway in Sonoma, CA and Miller Motorsports Park in Tooele, UT. Labels: HASA Pool Products, Live Blog, Moses Smith, NASCAR Camping World Series West, Toyota Speedway. Host Of Motorsports Mania On ICTV/DISH Ch 230. Guest On KMLE 108 FM And Channel 3 TV PHX. 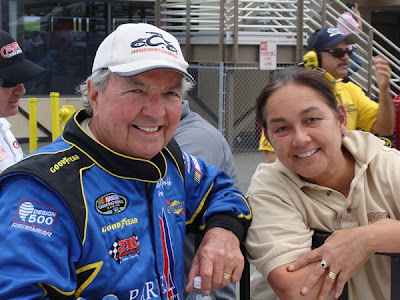 Wally Cahill has been involved with all types of motorsports for over nineteen years. 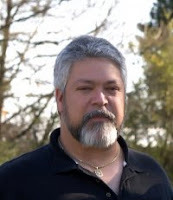 His articles and photos have been published in over twenty national magazines, in addition to working hand in hand with Clear Channel Entertainment; the world’s largest entertainment company that produces stadium style motorsports events. Wally has also participated in the two oldest races in America, the Pikes Peak Hill climb and the Indianapolis 500. In 1992, he and three other racers riding for Yamaha introduced the ATV class to the world famous Pikes Peak Hill climb by bringing the first Yamaha Banshees to the Colorado Springs, Colorado international event. 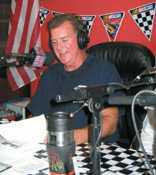 Recognizing the need for a real motorsports radio medium that focuses on getting behind the scenes in all sorts of racing, Wally created MOTORSPORTS MANIA in 2001. Working with many racing personalities, over the years, Wally produced and aired Arizona's most popular motorsports program. Unfortunately, Wally is in the hospital with some serious health challenges. Wally is an avid user of twitter. It would be awesome if NRM readers could reach out to Wally by sending a message of support to his account at @wallycahill. As Moses races in the King Taco "200" tomorrow, the team will be thinking of Wally Cahill and all the time, effort, and creative work he has given to promoting the sport we love. The Moses Smith Racing Team will be manning an eFusjon Booth at the King Taco “200” which will be held on July 4th at Toyota Speedway at Irwindale. The gates will open at 4:00 p.m. The booth will include experts (on the company and the compensation plan) to answer all questions. Additionally, free samples of eFusjon Edge and Raw on ice will be offered to race goers. Be sure to stop by the eFusjon Information booth and enter the free drawing to win a case (12 cans) of eFusjon. At The Track Special - - - Anybody who signs up for the MSR Energy Teamwill get a case to take home for samples and to market until their first order arrives! Labels: eFusjon, Moses Smith, NASCAR Camping World Series West, Toyota Speedway. Moses Smith, pilot of the No. 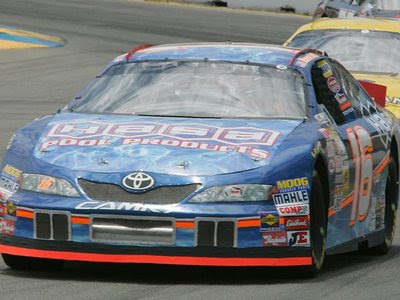 16 HASA Pool Products/White Flyer Toyota Camry for Bill McAnally finished in the top-ten at both visits to the Toyota Speedway at Irwindale in 2008. Smith looks to improve his percentages by putting the No. 16 HASA Toyota Camry into Victory Lane on July 4th. He is currently ninth in the chase and only 70 points out of the top-five. The ‘no. 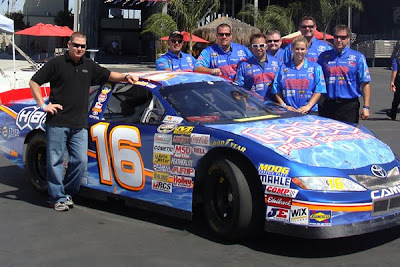 16’ car from Bill McAnally Racing has had great success at Toyota Speedway at Irwindale with nine wins. Smith and his crew chief, Mario Isola, look to put the ‘No. 16’ back in Victory Lane and give Toyota its first NCWS West win at the speedway and Hasa its first NASCAR Camping World Series West win. Copart, founded in 1982, sells more than 1 million vehicles each year online for insurance companies, banks, finance companies, fleet operators, dealers, the general public and others. Copart’s extensive inventory allows buyers to browse more than 50,000 vehicles each day.